We’re back to our exploration of plot points and literary themes for this week’s Theme: A Story’s Soul post at DIY MFA. This time, we’re looking at the midpoint, when the protagonist is in the middle of his story-goal pursuit – but not everything has gone the way he’d hoped or planned. Thus, the midpoint represents the character’s “mirror moment,” a shift in thought or momentum that helps the protagonist get back on track. And if you look closely, you’ll find that this scene often teems with literary themes. Want to Learn Some Icelandic? I’m getting ready for my upcoming trip to the Iceland Writers Retreat. (In fact, I fly out 3 weeks from today! 😀 ) And in between the practical and logistical preparations, I’ve spent some time studying the Icelandic language. It’s mostly to learn basic sayings or words / phrases that are good for tourists to know. But I’ve really enjoyed the challenge of it so far (Icelandic isn’t easy to learn!) and the beauty of its overall sound. If your answer is “yes,” let me know in your comments on this post. Feel free to suggest basic words or phrases you’re curious about, too. If I get enough responses, I’ll post an article here with written translations and a couple YouTube videos (by native Icelandic speakers) before my trip. So, are you interested in learning some Icelandic? If so, which words or phrases? (Basic ones that are easy to look up would be best. 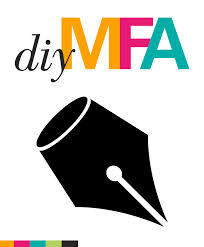 *wink*) And as always, if you have any comments on the DIY MFA post, feel free to share them here or at DIY MFA. DIY MFA Posts, Just For Fun, News! I’d love to learn some Icelandic! Especially since I plan on going there one day and part of one of my book languages is based on Icelandic. What are some of your favorite phrases? Right now the only phrases I’ve studied so far are basic ones that are good for tourists to know. Like “Hello” (hallo), “Goodbye” (bless bless), “thank you” (tak fyrir), “please” (vinsamlegast), and “Do you speak English?” (Talarðu ensku, pronounced tah-lahr-thoo ehn-skoo). Oh, and “Where’s the bathroom?” (Hvar er klósettið?, pronounced kvahr ehr klow-seht-tith?). That one is important, too. 😉 So I don’t have a favorite, mostly because I’m focusing on phrases that might be good for me to know while I’m there. I'll be checking out the new DIY MFA post now! It couldn’t come soon enough, tbh. I think I say this in a post that’s due out tomorrow, but this trip is going to be a welcome chance to clear my head. Not sure if the Icelandic post is going to happen at this point. I haven’t received many suggestions, so instead I might include a few basics in next Thursday’s post, which will be the March 2017 edition of What’s Making Me Happy. Yay, the trip is coming! And when I’m reading these words, it’s less than 2 weeks!